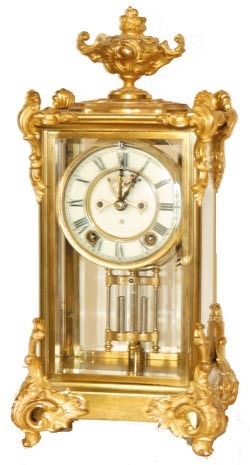 Ansonia Clock Co., crystal regulator, "Marquis", C. 1904. Almost a perfect crystal regulator, rich gold ornaments still has most of the original gilt; brass case body is sound, not polished in a long time but still satisfactory. The case is 15.5" high, all original including the 2 piece porcelain dial with only an inkling of a hairline around one arbor, good open escapement, original hands and imitation 2 jar mercury pendulum. 4 beveled glasses, all perfect. 8 day movement was just serviced, is running very good, and strikes half hours on a standing cathedral gong. This one should be in someone\'s collection. Ly-Ansonia #334.